OSGL Logistics is a premier provider of domestic Transportation Management solutions. While some companies are limited in the in-house managed solutions they can offer, OSGL Logistics has a complete transportation portfolio under its control. - Arrangement of special vehicles for movement of OD Cargo. - Safe handling of cargo. We are offering Domestic Transportation Service to our clients. Our professionals have immense experience in handling multi-dimensional consignments. We have arranged multiple modes of transportation to deliver the consignments of the clients in a safe and timely manner. We offer our services through a vast fleet of specialized transport vehicles for your varied road transportation requirements. Transport usually represents the initial and end phase of the production, from provision of raw material, to the distribution of the finished article. For this process to work correctly and generate profit it is necessary that on departure and arrival, delays and accidents are avoided. We Provide road, rail and air interstate and intercity transportation. With our own fleet of trucks and 80 Brand new 40 feet transport trailers, divya provides that additional critical facility to the customers to meet their timebound shipments even at the last moment. Divya Shipping & Clearing Services Pvt. Ltd.
- A fleet of own / contract vehicles of varying sizes to suit all needs. - Competitive freight rates for national trucking for loads throughout country. - Long term contracts with reliable carriers for part load services. - Dedicated team of staff to monitor / track shipments & constantly update customers. - Milk run deliveries for auto industry suppliers. Transportation for all our customers will be handled through our Group Company M/s. SHRIWANI Carrying Corporation Limited. - Currently we are serving all major automotive giants such as VW, Maruti, Hyundai, Mahindra and Mahindra through M/s. SHRIWANI Carrying Corporation Limited for moving finished goods. We are engaged in Domestic Transportation Services, our client can avail these services at very reasonable price. 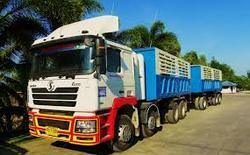 We also ensure safe and fast operation while transporting our client’s goods. We can easily deliver goods to your site whether it be a remote commercial site or a domestic difficult access scenario.